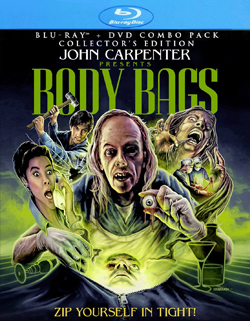 Read my review of Body Bags, out this month on Blu-ray and DVD from Shout! Factory, at Slant Magazine. This entry was posted in film, movie reviews and tagged Alex Datcher, blu-ray, Body Bags, Charles Napier, David Naughton, david warner, Deborah Harry, Eddie Velez, George Buck Flower, Horror Anthology, John Agar, john carpenter, Kim Alexis, Lucy Boryer, mark hamill, Molly Cheek, Robert Carradine, roger corman, sam raimi, Sheena Easton, shout! factory, slant magazine, stacy keach, tobe hooper, Tom Arnold, Twiggy, wes craven. Bookmark the permalink.